Dr. Rajan Aggarwal is an ophthalmologist who specialises in treating defects associated with the retina. He successfully completed his MBBS from the reputed University of Medical Sciences & Guru Teg Bahadur Hospital in the year 2004. 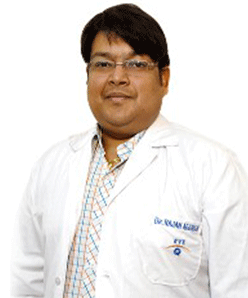 After MBBS, he pursued DOMS from Dr. Ram Manohar Lohia Hospital, PGMIER and received the degree in the year 2007. Then, he reserved a fellowship from the Shroff Charity Eye Hospital, New Delhi, specializing in disorders associated with retina. Dr. Rajan Aggarwal has worked in the field of research and treatment for many years. He also provides advice for other eye ailments such as chalazion, burning eye, black eye, age-related macular degeneration (AMD), bleeding under conjunctiva-subconjunctival haemorrhage, eye burning accompanied by itching and dischargeetc. Over the course experience in research and study, he has treated a large number of patients successfully. He can be consulted during our OPD timings. Retinal tearing and retinal detachment are treated using retinal surgery which is combined using laser photocoagulation and retinal freezing cryopexy techniques. EYE-Q offers treatment which is best suited to patient requirements. EYE-Q eye doctors have successfully performed retinal surgeries without any complications. Cataract is a disease which mostly occurs in the elderly population. Cataract requires immediate doctor advice to get the treatment. EYE-Q offers laser automated technology for Cataract surgery which is a bladeless and painless method. EYE-Q doctors have successfully treated cataract patients and again brought back life to their vision. Lasik surgery is the best way to get rid of the eyeglasses. EYE-Q hospitals offer comprehensive detailed eye check up to check whether the patient is suitable for LASIK surgery or not. The check-up ensures that the patient is completely fit to undergo treatment. EYE-Q doctors have a decade of experience in performing surgery. Glaucoma occurs when the optic nerve gets damaged due to intraocular pressure which can result in vision loss also depending on the severity. Doctors need to be consulted immediately for better chances of recovery. Eye-Q specialist doctors have a wide range of experience in dealing with Glaucoma which requires treatment combined with psychological counseling. Refractive defects include myopia, hypermetropia, and astigmatism which generally occurs due to refractive errors leading to vision defects. Refractive services include Lasik surgery which is a tried and tested method for refractive errors. EYE-Q dedicated team of doctors have years of experience in treating the patients. Oculoplasty surgery is offered as a cosmetic, corrective and reconstructive eye surgery in cases of retinoblastoma and ocular-orbital eye defects. EYE-Q offers comprehensive and contemporary approaches for diagnosing and treating eye defects. EYE-Q surgeons have more than a decade of experience for treating eye patients and providing them with a post-operative care. Squint and Amblyopia fall under pediatric eye disease which requires early treatment. EYE-Q eye specialists are trained for pediatric eye care which is generally different in approach with respect to the adult patients. Best technological equipment is present for visual evaluations of children and its correction. Optical services are offered at EYE-Q hospitals. Our experienced optometrists are professionally qualified to deliver quality services to the clients. EYE-Q has invested in faster glazing machines to offer the best spectacles and contact lenses for the patient with vision problems. Eye-Q has collaborated with Pinnacle optical Pvt Ltd.
General eye care deals with a routine check-up and common eye problems such as dry eyes, conjunctivitis etc. EYE-Q hospitals have a world-class infrastructure to cater to the needs of the patients. Doctors have vast experience in offering solutions to patients for eye care and treating general eye problems. Note: Prior approval of TPA is required in case of availing cashless mediclaim. 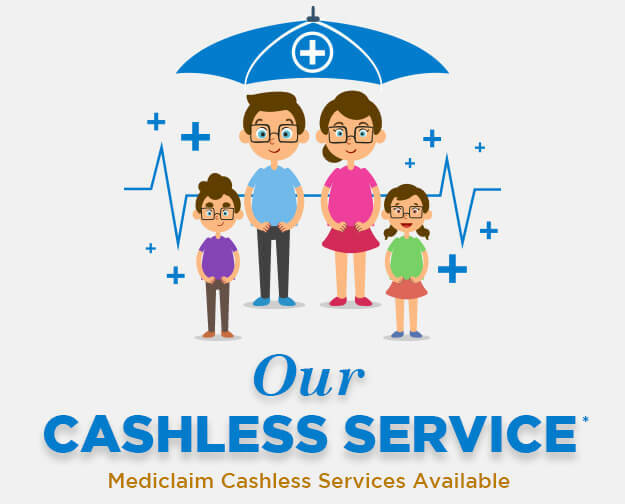 Check all the conditions and procedures insurance before availing cashless mediclaim. Customised Bladeless Lasik is really worth it. I’ve started seeing the world in a different way and more than anything I wanted to experience the world naturally without contact or glasses. I chose Eye-Q India because when it comes to your eyes you shouldn’t trust anyone but the best. I was impressed by the advantages of the new Bladeless Laser Cataract Technology. After the surgery at EYE-Q India, I am comfortable and have a clear vision for my right eye with Multifocal Lens. I found it very convenient and long term benefit. I am very pleased with my whole experience at EyeQ India Hospital. Everyone was very caring and professional. I especially liked the personal counseling that was provided to me. It made me felt confident I would get the best results post-surgery. Thank you, Dr. Ajay Sharma, for an unforgetful experience. Dr. Ajay Sharma was so patient and caring; he made me very comfortable. It has been 4 days since my surgery and I can already see better. I had suffered eye injury during a cricket match which caused retina injury, it feels great to have my vision back.